Brede features beautifully maintained examples of historic engineering and provides a rare chance to see the past in action and participate in its preservation for the future. Nowadays we take it for granted that when we turn on the tap, out comes quality water. But how is it moved around? The answer is in pipes, propelled with the help of high pressure pumps. But in the 1900s much reliance was given to steam power to lift water from deep wells into treatment works. Then the clean water needs to be pumped to local reservoirs built on high-ground for distribution by gravity to homes and businesses. 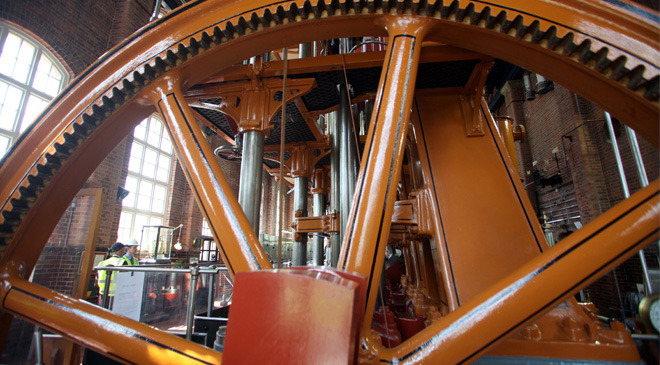 In the 1960s, many of our Victorian and Edwardian engineering masterpieces were demolished, but some survived, such as the Giants of Brede steam pumping engines. Just six miles from Hastings stands the Brede Waterworks site, where two of its original triple expansion steam engines are housed in Grade II listed buildings. At Brede you will see several 'period' examples of British engineering being renovated to impressive high standards. First there is a 410hp triple expansion steam pumping engine built by Tangyes of Birmingham in 1904 and restored to original colours for its centenary. It is housed in the original waterworks building built by the Hastings Corporation Water Department. Secondly, there is another engine to a more modern design, installed in 1940 despite the start of World War Two. Numbered 5058, researchers have confirmed it to be the last of its type supplied by Worthington Simpson of Newark and its 420hp is capable of pumping 3.5 million gallons per day against a lift of 515ft into the service reservoirs at Fairlight and Baldslow. Thirdly, a range of water artefacts from an earlier collection kept by Folkestone and Dover Water Services is displayed in the old boiler house. A noteworthy exhibit is the first triple expansion horizontal steam pumping engine made by the Simpsons in 1889. All the engines are currently being run by compressed air but will in due course be operated by steam. In its heyday 33 men were employed at the waterworks. Many lived locally and there is a fascinating social history story still to be researched. Brede Steam Engine Society holds open days throughout the year. Generally admission is free but a charge might be made for special events days. Refreshments, sales and souvenir items are available. The giants are situated in the beautiful Brede valley at the heritage centre with Brede waterworks. The site is some six miles from Hastings along the A28 road to Ashford. Please look out for a narrow left turn (when approaching from Hastings) near the top of Brede Hill by the 40mph sign and just before the Red Lion public house. The restoration work is being undertaken by the Brede Steam Engine Society which always welcomes new members. For further details and bookings by prior arrangement, call 01323 897310. Public open days are the first Saturday of every month and every Bank Holiday Monday throughout the year from 10am–4pm. Entry is normally free and parking is available at these times.